After last year’s new generation of SX machine was launched with revolutionary WP AER 48 forks, a new chassis, plus new engines over previous models (except 250 SX), the KTM R&D departments in Austria and the USA have been making further improvements for 2017, and updated the 250 SX model to the latest specification of chassis with a brand new engine. 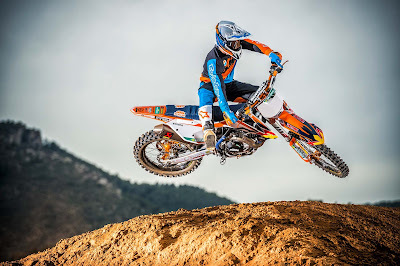 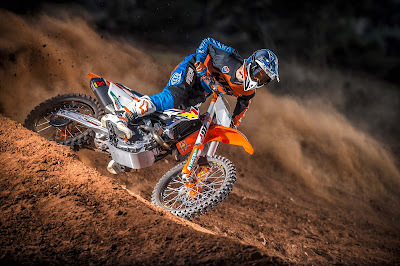 With input from the KTM Motorsports department being influential to serial production, especially in the USA where the factory team must race homologated machines and we can note that Ryan Dungey has just won back-to-back 450 Supercross World Championship titles aboard a KTM 450 SX-F, the SX model line-up is better than ever. 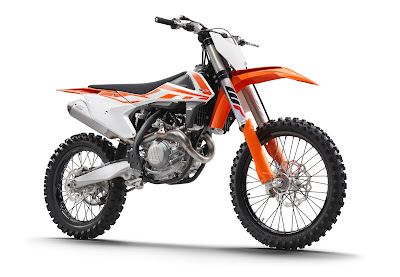 With typical KTM characteristics including a precisely designed, high-tech lightweight chrome-moly steel frame, high-tech Brembo brakes, lightweight CNC machined hubs with high-end Excel rims, Dunlop Geomax MX 3S tires, No-Dirt footpegs, an intelligent air filter box system, precisely designed bodywork, the all important starter (except 125 SX) and much, much more already fitted to these machines, KTM has once again reached new heights with the latest model range. For 2017 there are a number of refinements over last year including traction control for 4-stroke models, which is part of the new multifunctional handlebar map switch, new suspension components and settings, new graphics and other exciting details.